A stylish, simply yet elegantly dressed young woman steps in front of Tiffany’s on an empty New York street. Large, dark glasses cover her eyes, a tiara sits upon her frosted beehive, she is dripping pearls, and her slim, long black evening dress perfectly matches her black sandals. A soft, sweet song evokes a mood of melancholy yearning as the golden light of dawn washes over the scene. When Audrey Hepburn watched her reflection in that shop window in 1961, she set the entire tone and look of a movie and created a character that would come to inhabit the minds and hearts of the public for decades to come. Truman Capote’s novella “Breakfast at Tiffany’s,” first published in the November 1958 issue of Esquire, was adapted by director Blake Edwards and writer George Axelrod with a light touch. 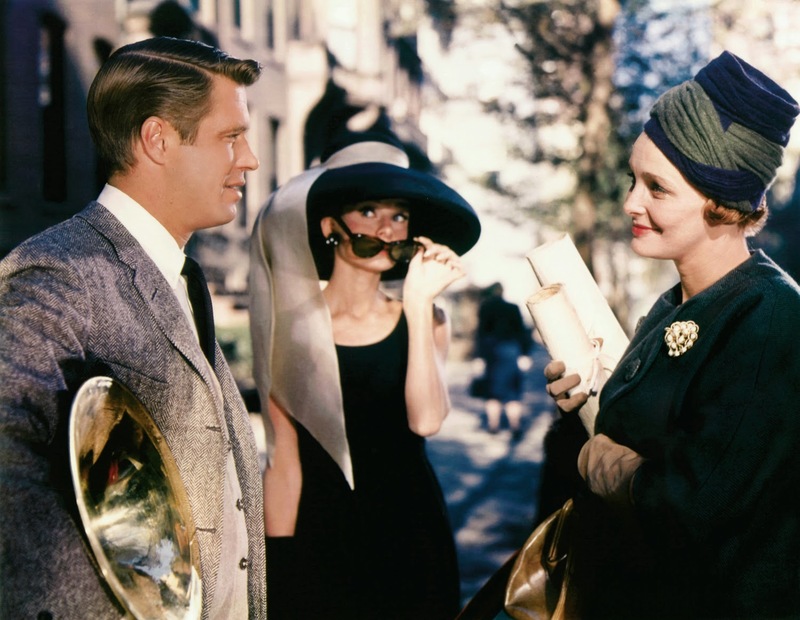 Dealing with comedy, romance, and poignancy in a swanky Upper East Side setting, the movie follows Holly Golightly, a charming, carefree, independent New York party girl, and her upstairs neighbor, writer Paul Varjak (George Peppard). While the film hews closely to its source material for the most part, maintaining much of the pungent, comical, racy dialogue (with some lines tuned down to Production Code standards), the few liberties it does take are not insignificant. The tone of Capote’s story was harder and more cynical; Edwards makes it soft and sentimental, bestowing upon it a Hollywoodized happy ending, dropping some characters and adding others, and turning the subjective point of view of the novella objective, and its narrator, a dispassionate admirer and friend, into a romantic interest. ***This is not a review of the film, but a comparative analysis of the Capote’s novella and its screen adaptation, and it contains spoilers. Capote’s story begins years after the unnamed narrator knew Holly. The female character has disappeared from his and bar-owner and friend Joe Bell’s lives. She is presented as a mysterious being, more like a legend than a human being. The two men ponder the fate of the woman they both loved and decide she must be dead—“Or in a crazy house. Or married” (pg. 9). This conclusion peaks the reader’s interest by establishing Holly’s unpredictability and volatile nature. Even after knowing her, she remained, for both characters “a stranger, a stranger who’s a friend” (pg. 9). This conversation leads the narrator to remember Holly and the short time they spent together. At first we, as he had years ago, get only decontextualized details, glimpses of this woman: the printed, Cartier-formal name on her mailbox, accompanied by the word “traveling,” her voice, described as “silly-young and self-amused” (pg. 11) her writing, a “freakishly awkward, kindergarten hand” (pg. 28), and finally her description. 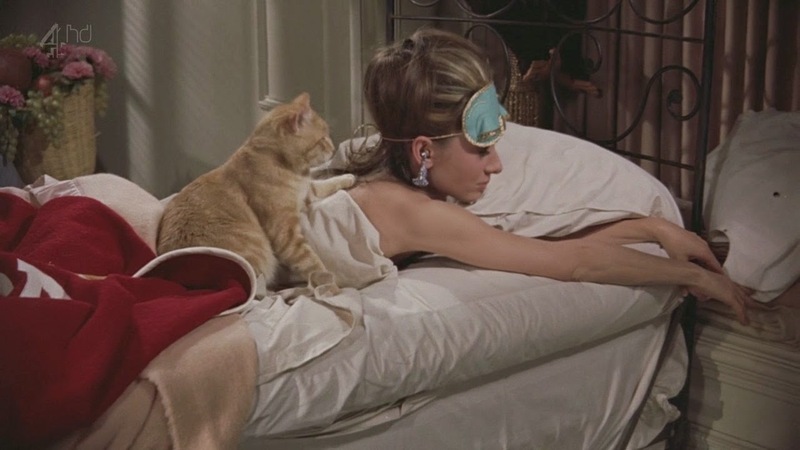 The one element that translates seamlessly from page to screen is the main female character of “Breakfast at Tiffany’s.” Holly’s multi-colored, vanilla hair is cut short like a boy’s; “she wore a slim cool black dress, black sandals, a pearl choker. For all her chic thinness, she had an almost breakfast-cereal air of health, a soap and lemon cleanness.” Her face was “beyond childhood, yet this side of belonging to a woman” (pg. 12). In this description, the image of Audrey Hepburn crystallizes, beautiful in her elfin androgyny, petite but strong and self-assured. In the childlike, pixie physique and innocent quality of the actress, she seems the perfect choice, the only choice to play Holly. “She was never without dark glasses, she was always groomed, there was a consequential good taste in the plainness of her clothes, the blues and grays and lack of luster that made her, herself, shine” (pg. 14-15). The sunglasses, in the story as well as the film, betray the character’s need to veil herself from the world, to protect her conception of herself as an amoral New York socialite and forget her past identity. Her new persona, the one seen dining at high-end restaurants like “21” in the company of several men or dancing in the street under the El with “a group of whiskey-eyed Australian army of officers,” who takes fifty for the powder room and another fifty for cab fare, is nothing but a fabrication which sprang from Holly’s own imagination probably when she was still Lulamae Barnes (pg. 15). “Nobody’ll ever know where she came from. She’s such a goddamn liar, maybe she doesn’t know herself anymore,” Hollywood agent O.J. Berman tells the narrator (pg. 32). “She isn’t a phony because she’s a real phony. She believes all this crap she believes” (pg. 30). In Edwards’ film we see her disconnected from the world, from reality, through her inability to communicate. The first time she meets Paul, he has woken her up by ringing her intercom and she is wearing a sleep mask and ear plugs to block out the light and noise; the mask, however, also hides Holly’s identity. Her phone is stuffed in one of her many suitcases; “it muffles the sound,” she explains. “Like many people with a bold fondness for volunteering intimate information,” Capote writes, “anything that suggested a direct question, a pinning-down, put her on guard” (pg. 19). Thus, she never speaks about her past in the film until she is forced to by her husband showing up, and when Paul asks her why she’s crying in her sleep, she warns, “If we’re going to be friends let’s get one thing straight right now. I hate snoops!” Her childhood story, as described in Capote’s novella, is “elusive, nameless, placeless, an impressionistic recital, though the impression received was contrary to the one expected, for she gave an almost voluptuous account of swimming and summer, Christmas trees, pretty cousins and parties: in short, happy in a way she was not, and never, certainly, the background of a child who had run away,” a child who got married at fourteen to a horse doctor and father of children older than she was (pg. 54). In the novella, Holly sings about “a-travelin’ through the pastures of the sky,” which is, in a sense, what she is doing—suspending herself above the relationships of human existence and refusing any strings of attachment for fear they will tie her down (pg. 17). But, at the same time, she recognizes the sky is “an empty place; so vague. Just a country where the thunder goes and things disappear” (pg. 74.) There is no stability and security in the sky, in a free, detached, unfettered existence. The character is a self-described “wild thing,” and you should “never love a wild thing,” she advises Joe Bell. “That was Doc’s mistake. He was always lugging home wild things. A hawk with a hurt wing. One time a full-grown bobcat with a broken leg. But you can’t give your heart to a wild thing: the more you do, the stronger they get. Until they’re strong enough to run into the woods. Or fly into a tree. Then a taller tree. Then the sky… If you let yourself love a wild thing you’ll end up looking at the sky.” (pg. 74). Holly’s most prized possession, and her undoing, is her unrelenting sense of independence. The character can’t bear to see any living creature entrapped, and sees commitment, and even love and a sense of belonging as bars of a gilded cage. This is why she refuses to tie herself to anyone, even her cat, a “poor slob without a name.” She hasn’t a right to give him one, she explains. “We don’t belong to each other: he’s an independent, and so am I. I don’t want to own anything until I’ve found the place where me and things belong together. I’m not sure where that is just yet. But I know what it’s like. It’s like Tiffany’s” (pg. 39). Her adoration for the store has nothing to do with the jewelry itself, with the materiality of the place, but with a more elusive and spiritual sense of being at peace, the idealistic idea that “nothing very bad could happen to you there, not with those kind men in their nice suits, and that lovely smell of silver and alligator wallets,… the quietness and the proud look of it” (pg. 41). 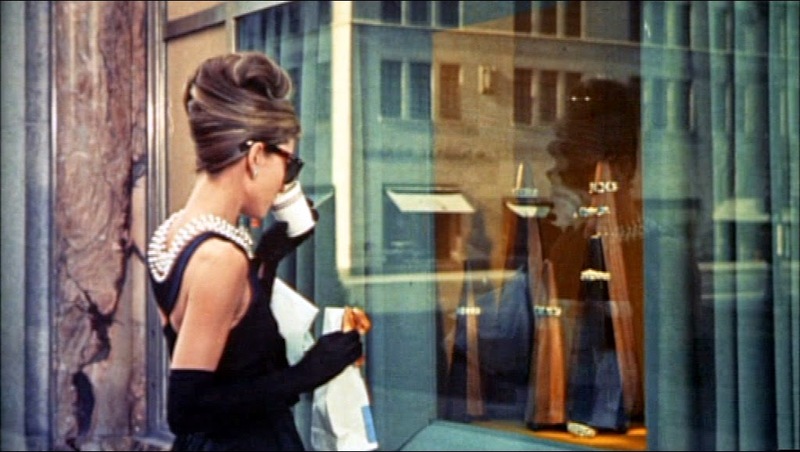 Tiffany’s becomes a symbol of the comfort and stability she longs for, which is missing from her nomad existence. “If I could find a real-life place that made me feel like Tiffany’s,” she declares, “then I’d buy some furniture and give the cat a name” (pg. 41). In fear of ending up in a cage, she has built one around herself that cuts her off from other people; as Paul says in the film’s final, poignant scene, “It’s not bound in the west by Tulip, Texas or in the east by Somaliland; It’s wherever you go, cause no matter where you run you end up running into yourself.” Edwards, director of photography Franz Planer, and set decorators Sam Comer and Ray Moyer convey Holly’s entrapment through the image and the production design. In several shots, she is shown through a latticework of blinds and shades, standing against vertically striped wallpaper, or framed by railings. Her mostly unfurnished apartment creates not a sense of freedom, but confinement. All her crates and suitcases, her badge of independence, are always in her way, strewn in disarray around her flat. 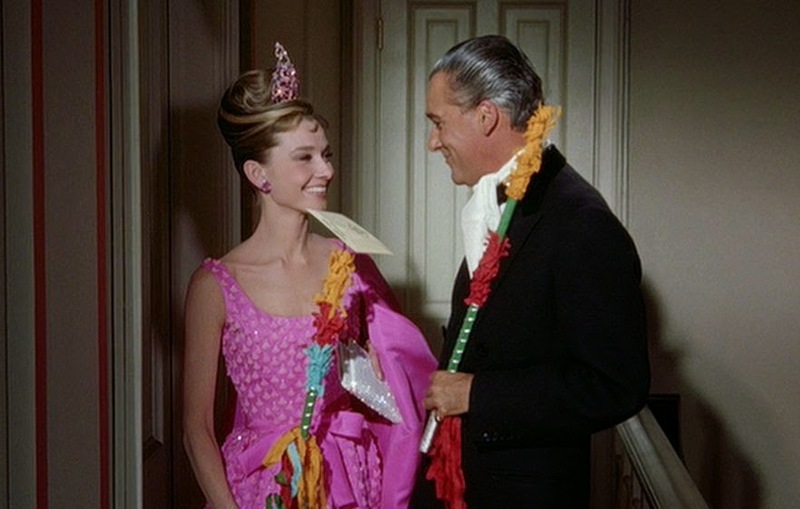 It is only in the scenes of her and Paul at Tiffany’s, on the city streets, or the public library, and the last shots of the movie that the cinematography opens up, the camera tracking and circling, freed from its usual motionlessness. But while Hepburn’s Holly captures the essence of Capote’s writing, other characters have been changed, omitted, or added. Some of the characters of Capote’s story, such as Joe Bell, are understandably cut out due to time limitations. Others, including Paul’s handsome older benefactress, only known as 2-E (Patricia Neal) and the Tiffany’s salesman (John McGiver), are absent from the novella but add to the effectiveness of the movie. 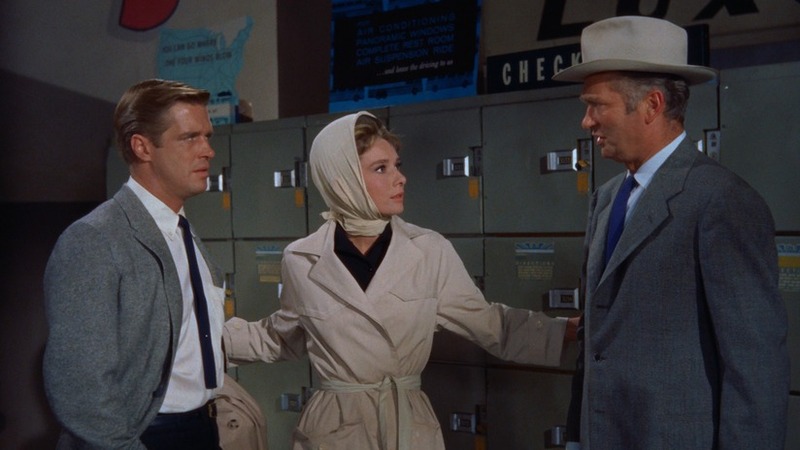 Buddy Ebsen, as Doc Golightly, offer a heartrending performance as a man who loves Holly without understanding her. Mag Wildwood’s (Dorothy Whitney) part is shortened, but memorable. José Luis de Villalonga, as Mag’s—and then Holly’s—Brazilian boyfriend fits the role perfectly (“He’s okay, I guess, if you like dark, tall, handsome, rich-looking men”). 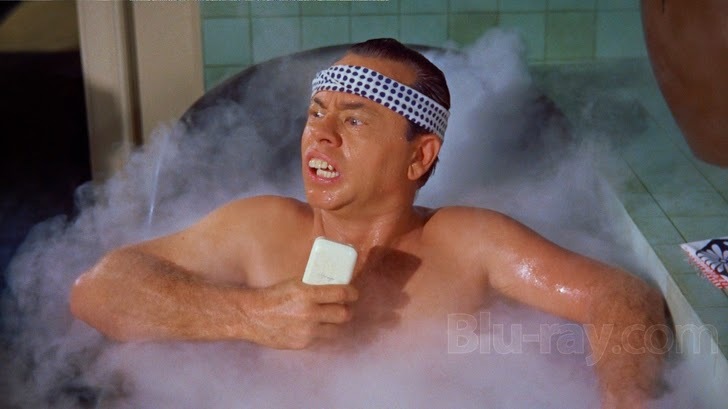 However, there are also egregious casting mishaps in the story’s cinematic adaptation, the most horrifying of which is Mickey Rooney—prone to screaming “Mrs. Gorrrrrrighty”—in yellow-face as Mr. Yunioshi, turning the character into a bucktoothed, myopic racist caricature of the Japanese photographer. Paul is placed in the same situation as Holly, not exactly a male prostitute—as she is not a call-girl—but not above accepting money from a married woman he is sexually involved with. Always used to receiving financial help from others, he is attracted to Holly because of his ability to help her. “It’s a nice feeling, for a change,” he tells 2-E, and breaks it off un-amicably when she writes him a check to take Holly somewhere as “a vacation with pay,” only “a matter of fair labor” or advises him to get some of the other boys together and organize a union to receive full benefits. “I got a check of my own,” he says, and, walking into a closet filled with expensive suits, suggests, “When you get yourself another writer to help, get one my size. That way you won’t have to shorten the sleeves.” A large woman dressed in imposing, dark, neutral-colored tailored suits, 2-E is as far from Holly as one could get; perhaps dating a fragile, child-like waif is the change Paul is looking for. Turning him from an admiring observer to a romantic lead, however, misses the point of Capote’s novella and proffers a sentimentalized, white-washed happy ending that goes against much of what the author created. Although I cannot say that I completely regret the iconic final scene in the rain, it changes the meaning of the source material. Through it, Holly is redeemed, baptized as it were, as a new person, someone who has evolved and grown from a “very lovely, very frightened girl,” as Paul describes her, to a woman ready to commit herself to another human being. In going with the title of Paul’s book (Nine Lives), the female character lets go of her identities as both Lulamae and Holly and ultimately forges a third. Sometimes it is better to leave things open-ended, so the reader or viewer can wonder and speculate, imagine their own ending; there is poignancy in the incompleteness of Capote’s story, and in Holly’s single-minded determination to remain true to her conception of herself as she goes off to Brazil asking the narrator to compile a list of the richest men in the country. One can’t help but wonder whether the gay author didn’t write himself into the narrator. His attraction to Holly in the novella is purely platonic. “I was in love with her,” he writes, “just as I’d once been in love with my mother’s elderly colored cook and a postman who let me follow him on his rounds and a whole family named McKendrick” (pg. 76). There is no sexual desire or truly romantic feeling in this description of his love. In the film, as the Production Code will have it, all references to homosexuality have been removed. So the cinematic version of Holly doesn’t become convinced that the characters of Paul’s short story are “a couple of old bull-dykes” (pg. 21). She is no longer looking for a “nice lesbian” roommate to do her housework or commenting that, “Of course people couldn’t help but think I must be a dyke myself. And of course I am. Everyone is: a bit. So what?” (pg. 22). There is no hint of Rusty Trawler’s sexual orientation or the fact that he might feel “safer in diapers than he would in a skirt” (pg. 42). And perhaps, sadder of all, we lose the accepting, life- and love-affirming, before-its-time message that, “A person ought to be able to marry men or women… Love should be allowed” (pg. 83). However, the scenes Edwards’ film either expands on or adds to the novella are perhaps its best. The party scene and the sequence at Tiffany’s benefit from a magical inventiveness that captures and perhaps surpasses the essence of Capote’s writing. The cocktail party, a Technicolor triumph of innovation, noise, and color, is infused with a kind of intoxicating, inane glee: there is a man wearing an eye patch over a perfectly healthy eyeball, a middle-aged woman laughing hysterically in the mirror and then crying for no apparent reason, her makeup streaming down her face, another guest who uses a kneeling Paul as a couch, and a young woman fond of jumping on men’s backs indiscriminately and clinging to them, not unlike a monkey, until she is moved to her next perch. 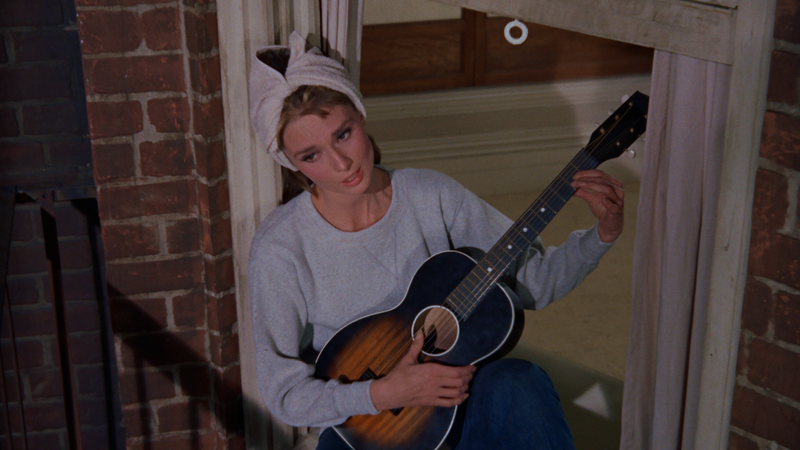 The Tiffany’s scene, in contrast, is quiet and subtle, but no less cheerful. As Holly walks in wearing a bright orange jacket, she stands out against all the men in dark suits, and she has never looked better. There is a childlike mood of mischief and fun that runs throughout the entire day the characters spend together, but, at the store, it subsides, replaced with a sense of peace and happiness as the clerk offers them a sterling silver phone dial for under $10 and then agrees to engrave a Crackerjack prize. It really does seem like nothing bad could ever happen at Tiffany’s. Both Edwards’ film and Capote’s novella are almost flawless in creating a character as memorable and likeable as Holly Golightly, an innocent who calls everyone “darling” and constantly complains about “quel” this and “quel” that. After spending a couple of hours and a couple dozen pages with her, indeed, everything else seems like a salt-free, sugarless diet, like Capote’s narrator says. And while I prefer the book to the movie, both are charming in their different ways, effectively adapting the same content to two different media. The essence of the novella, as well as much of its dazzling dialogue, is maintained, and the scenes and characters the film adds are valuable to understanding and enjoying the story. 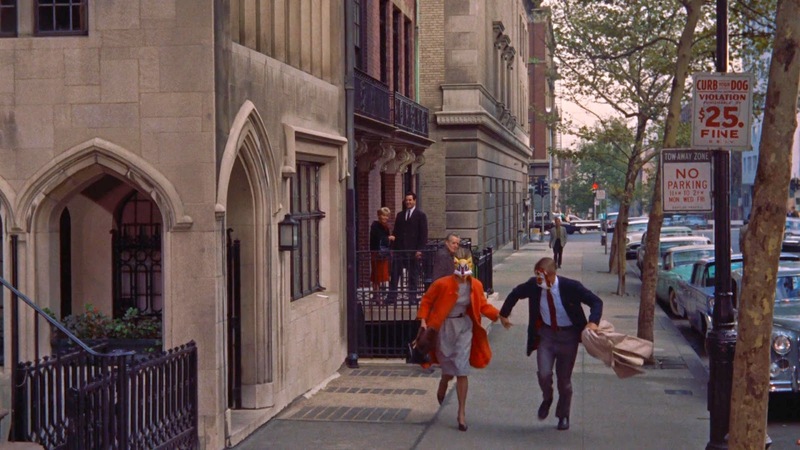 It truly is wonderful to behold the film’s sense of place, its fabled and fabulous Upper East Side setting shot in the loveliest of colors, all bright and brightly lit. However, the final scenes of the film are too contrived, too idealistic, too syrupy; this enchanting pixie was not supposed to have a fairytale ending.